Low supporter turnout for Richard Blumenthal has forced the campaign to send out an alert Tuesday afternoon urging supporters to get out to the polls. Blumenthal is running against Linda McMahon in a highly publicized campaign for US Senate in Connecticut. The Real Clear Politics average of all national pulling has Blumenthal leading McMahon by 9 points, however that lead has been shrinking in recent weeks. Polls close in Connecticut at 8PM ET. If McMahon wins, I'm gonna have to lock this thread before 240 enters "hijack-spin mode" while Blacken spams with almost semi-related youtube clips! Personally, I want to see COD win more than anyone else. After all the crap thrown her way, and knowing the absolute meltdown it would case the far left and the RINO's, seeing her win would make me smile. Now, can we please have our "Attitude Era" back? my favorite linda mac moment was when they fired J R AND SHE KICKED HIM IN THE NUTSACK. wouldn't it be great if they did a homestate show where Linda and VKM come out and cut a promo along the lines of "You banned WWE shirts near polling sights, you accused me of bad business practices, you accuse me of putting out a product that is bad for kids.....well you ain't seen nothing yet!" 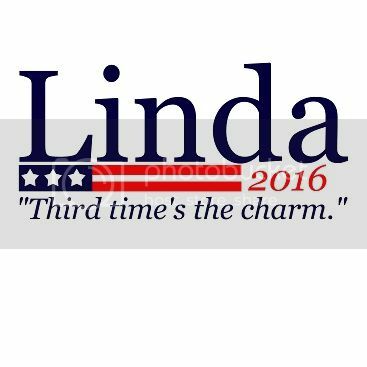 Linda breaks her silence: What’s $50 mil? Linda McMahon emerged from her witness protection-like vanishing act Monday to give Hearst Connecticut Newspapers one of her first interviews since losing to Democrat Richard Blumenthal in Connecticut’s bitter Senate contest. A one-woman stimulus package for political consulting, direct mail and television advertising industries, McMahon said she she no second thoughts about spending $50 million of her wrestling fortune on the race, a record for Connecticut. While her $50 million did not translate to a victory, McMahon said it did buy her name recognition that she can parlay if she decides to run for office again. McMahon made it no secret that she is eyeing public office, though she wouldn’t specifically say which direction she will go. McMahon confirmed that she has no plans to return to her post as chief executive of Stamford-based World Wrestling Entertainment, which took a beating from her political opponents in the primary and general election phases of the campaign. Another juicy morsel from our conversation was when McMahon, discussing the ballot shortage in Bridgeport and ruling to keep the polls open an additional two hours there, said she has a hard time believing that there weren’t isolated instances of voter fraud throughout the state. “I thought it was reprehensible what happened in Bridgeport, and I still think that we have voter fraud that happens throughout our state,” McMahon said. McMahon emphasized that any isolated causes of voter fraud would not have altered the outcome of the Senate race, however. Republican Linda McMahon, who spent some $50 million of her own money in a losing bid for the Senate this fall against state Attorney General Richard Blumenthal (D), is already eyeing 2012. During a taping of "Face the State with Dennis House" on Thursday, McMahon wouldn't rule out a run saying, "I'm not taking anything off the table." Her full interview is set to air in Connecticut Sunday. McMahon will also be up with a statewide TV spot next week thanking those who supported her in 2010. A large part of McMahon's appeal to some GOP insiders in the state in 2010 was her ability to self-fund and it helped her defeat former Rep. Rob Simmons (R-Conn.) at the state party convention earlier this year. But after spending $50 million in a losing effort during an otherwise favorable political environment for Republicans, McMahon would have a lot of convincing to do ahead of 2012 if she decides to make another run. As for Lieberman, many on the left are salivating at the chance to take him out in two years with some eyeing Rep. Chris Murphy (D-Conn.) as a challenger. Speculation has also swirled around Ted Kennedy Jr., who lives in Branford. Earlier this year Kennedy Jr. demanded that McMahon pull a campaign ad that included a clip of his uncle — President John F. Kennedy — talking about tax cuts. NOW, GIVE US BACK OUR F'NG SHOW!!!! !